"Slog" - To walk or progress with a slow heavy pace such as uphill in deep gravel. But we get ahead of ourselves. 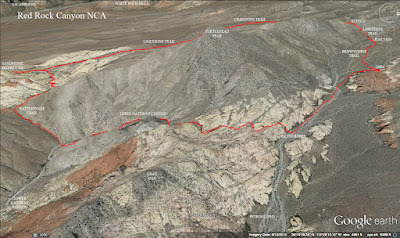 Brownstone Canyon lies on the hiking outskirts of the reaches of the Red Rock Canyon NCA scenic loop. 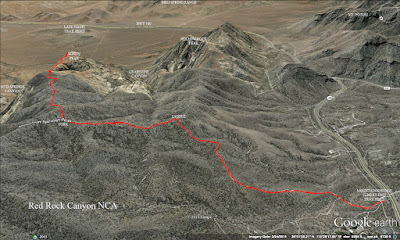 It is the next canyon over after Gray Cap Peak and its ridge. 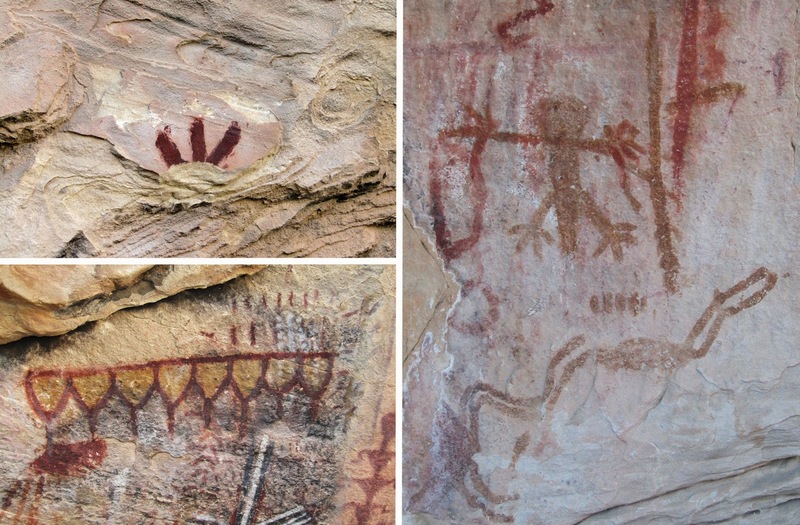 Within Brownstone Canyon, there are beautiful painted pictographs and chiseled petroglyphs put there by native Paiutes who lived a thousand years ago. These writings are well-preserved. Thanks for keeping them that way. 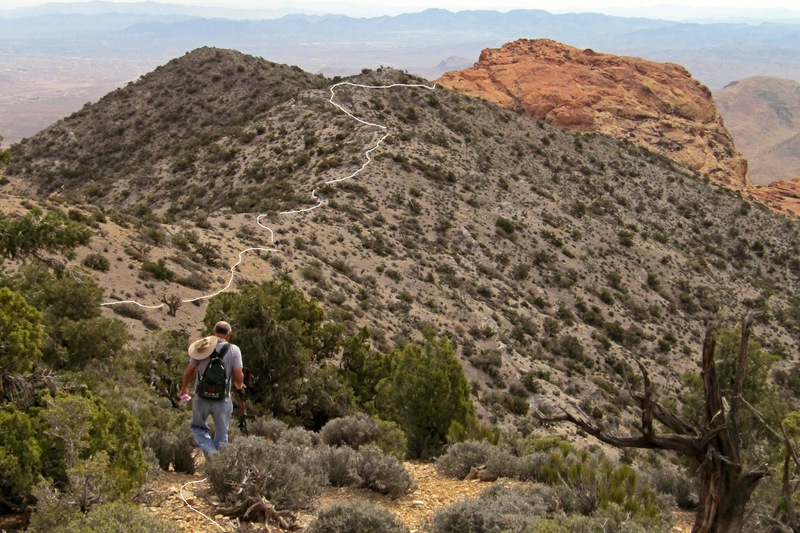 Fifteen hikers began their loop hike from Sandstone Quarry. 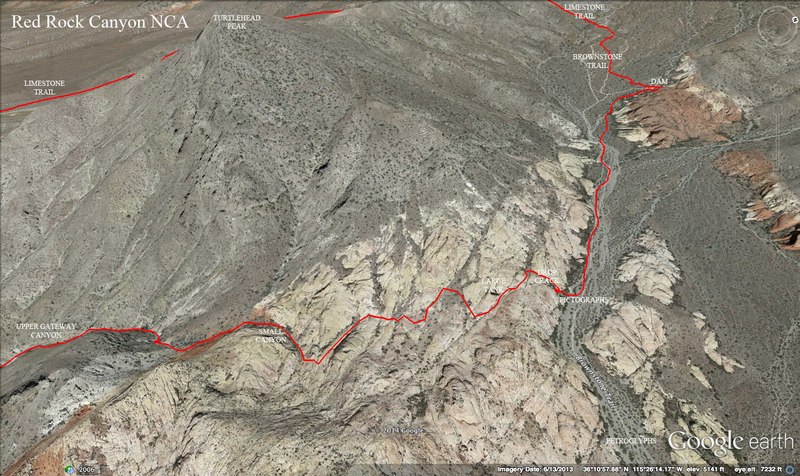 Before taking the left turn wash from the Calico Tanks Trail, we passed blooming Banana Yuccas and Redbud Trees. As we made our way over to the Rattlesnake Trail, conversation was non-stop! We used the small slot today. There was one obstacle puddle but we climbed around it. From there, we climbed the sandstone in a couple of different ways to end up on the Rattlesnake Trail that travels around the north side of the Calico Hills. We stopped at the base of Red Cap for a short water break and someone in the group felt many eyes upon us! Up on the hill leading to the backside of Turtlehead Peak, there were eight or nine male bighorn sheep lying on the ground. The white one was there, too. They watched us and did not seem alarmed. Their distance from us is seen in the photo to the left. Below, a close-up photo is given. This is the position we found them in and it is the same position we left them in. We passed them still at a distance as we descended down through the Rattlesnake Trail canyon. The canyon went by fast as we were still trying to warm up. It was a cool morning and the wind came and went throughout the hike. 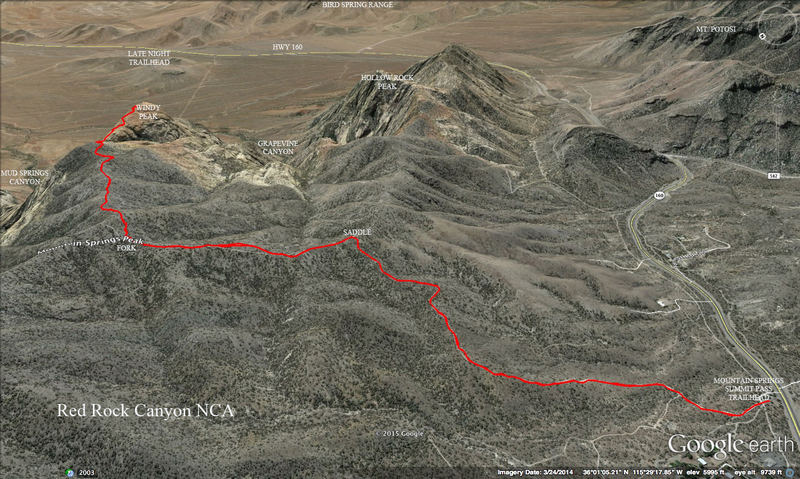 We junctioned with Gateway Canyon and turned left. The real scrambling began. Upper Gateway Canyon is great fun. It provides many limestone dry falls to climb. All the falls have different challenges. Today's hikers were familiar with the dry fall choreography. As Upper Gateway climbs go, this was a quick and smooth one. We took a few breathers but they were not long. We saved the longer rest for the limestone / sandstone line at the top of the canyon. Next, we turned to the left and balanced the geologic line up a few dry water slides. Halfway up to the top, we turned into the small sandstone canyon here. 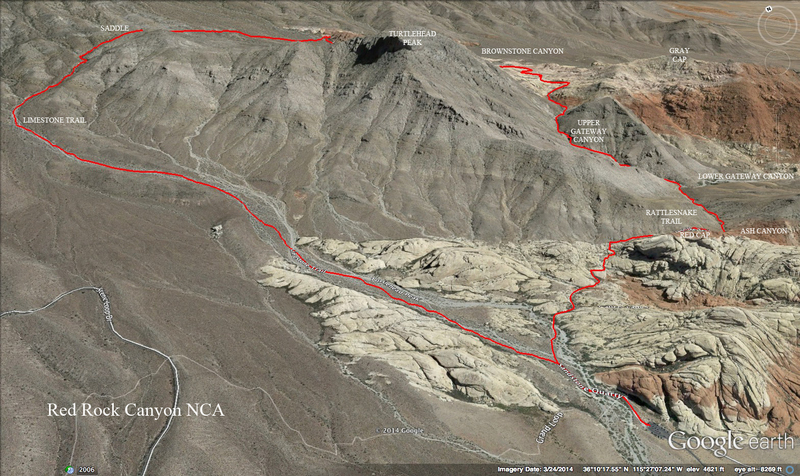 This beautiful little canyon provides some nice scrambling and a great way to get up to the ridge plateau crossover. At the high three level dry fall (read "black marks on the sandstone") on the left side of the canyon, we climbed up to start a zigzag dry fall ascent. It is safe, fun and a fast way to gain elevation. At the top, we followed the feeding canyon wash around and squeezed our way up to the plateau. We found the nice shallow tenaja but it was dry so we marched right through the tank and found our target rock outcropping ... the one that encloses that really big deep tank. This tank had water but it only covered about 2/3 of the bottom. We passed it and dropped down to find the Brownstone Canyon Crack. The line of hikers descended close enough together to help those who did not know this choreography. The descent went smoothly and ended right at the pictograph site. We took a nice snack break on the rocks in the sun. Comments were made at how nice it was to have a couple more minutes to digest their food! Perhaps it was the upcoming "slog" that prevented us from rushing into the next section of the hike! We gathered our packs and sticks and proceeded to slog up the gravel wash for what seemed like two miles. Actually, it was 0.7 mile when we had circled around a mound of red sandstone and found the inlet. There was an old water trough that at one time had piped water flowing through it. The dam took advantage of the naturally flattish sandstone and indentation. Rocks were cemented to form the dam boundary. We took photos then headed for the saddle area that we could see to the west. Someday, we will find the beginning of the trail, here. Twice now, we have found the trail by chance a little later. The little trail leads to an old road and, in turn, leads to the trail again. This time, the trail junctions with another road and we stayed on this road up to where it has a turnaround above a wash. This is the Brownstone Trail / Limestone Trail junction. We dropped into the wash and continued in the same direction. The wash narrowed. Finally, a trail on the left side took us steeply up to the saddle. A small break ensued. This is the hike's high point and we were all glad to start our descent. On the saddle, we found a trail that leads down the other side. 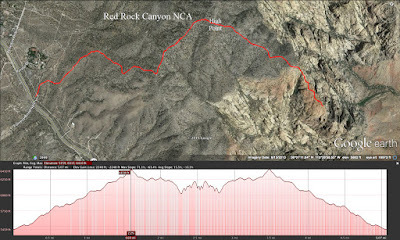 If you watch carefully, this trail and a few small cairns will take you down a ridge and into a medium sized wash. 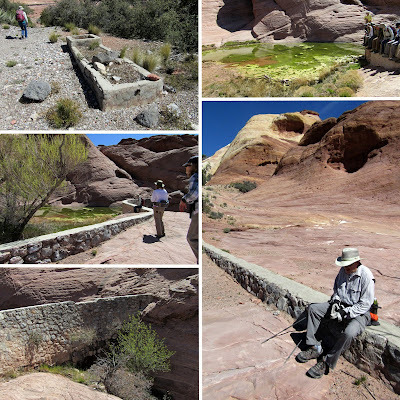 The Limestone Trail continues down this beautiful wash displaying distant views of the Red Rock escarpment. After a particular boulder drop, the wash begins widening. 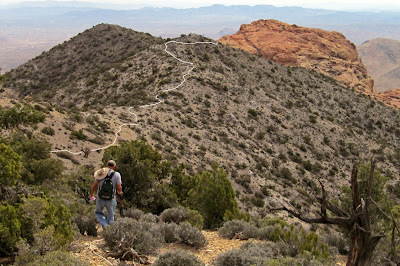 It continues to get wider as you hike the easy descent down past the base of Turtlehead Peak. We looked up to our right to see a small herd of mule deer escaping our route. Bighorns and mule deer! 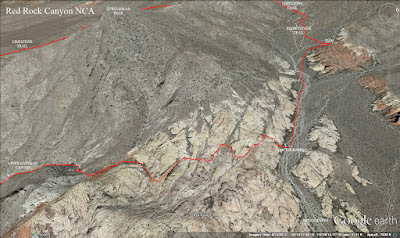 Getting closer to the Sandstone Quarry area, we connected with the Turtlehead Trail to finish. This is a great hike with many points of interest. Just be ready for the slog! The weather was a bit dismal and it was quite cool up on the Red Rock Canyon NCA escarpment but the fellowship was warm and the heart and lungs got their workout. Fifteen hikers arrived at the Mountain Springs summit pass trailhead for a simple out and back hike to Windy Peak. There were two hikers in our group who had not accomplished this feat as yet and we quickly introduced them to "Heartbreak Hill." It matters not what condition you think you are in. Heartbreak Hill is a formidable test. Most of the group raced up to the saddle! Eventually, the whole group gathered there. At this point, it was decided that the coordinator would hang back with one of the newbies. An accommodating pace should be the ticket. The others slowed their march a little and continued up the trail. The newbie actually did quite well. It is unfair to compare yourself to hikers that have regularly done difficult climbs for several years. Nonetheless, the coordinator was bid adieu at the high point of the hike and she continued down toward the sandstone with the others still in sight. The gray weather stayed cool as the hikers worked their way to the peak. Finally, the coordinator reached the limestone / sandstone line and stepped up onto the Windy Peak slab by climbing up the steep crack and stepping across to the parallel crack. She could still see the front hikers making their way up. Although the route is firmly implanted in her head, there are several cairns to mark the way. At one point, (photo to left), the hikers ahead took a different route over the rocks. It's all good if you get there in one piece! The group welcomed the coordinator as she made her last few steps to the peak. Then we all had our break. We noticed that the newbie was seen making his way along the last of the trail heading toward the sandstone. Probably not a good scenario for a newbie. We later learned that he stopped at the crack. We finished our break wandering around on the extended peak area then started back. We picked up the newbie on the limestone / sandstone line and started the climb back up to the high point. This climb may be the toughest part of the hike since it is on the way back. 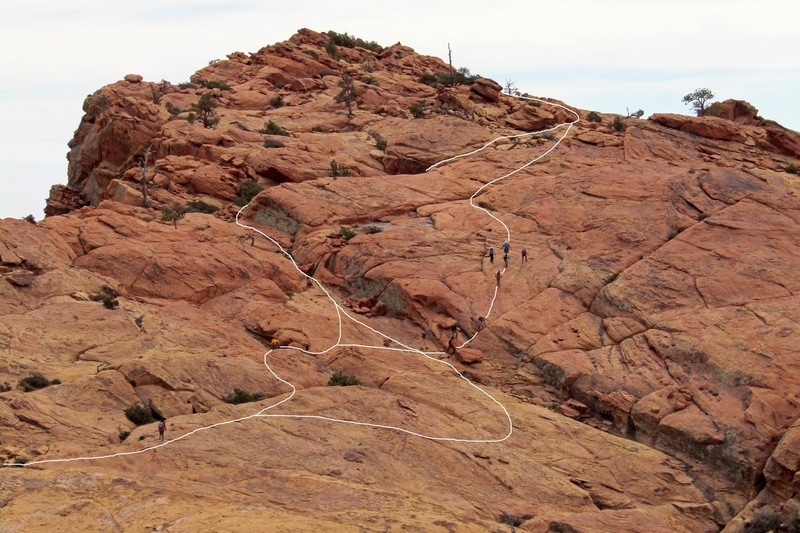 The group got spread out again and, at the high point, a veteran hiker decided to explore the route over the peak and down to the Mountain Spring Peak trail. When the coordinator and newbies made it back to the saddle where everyone was waiting, the veteran hiker was nowhere to be seen. 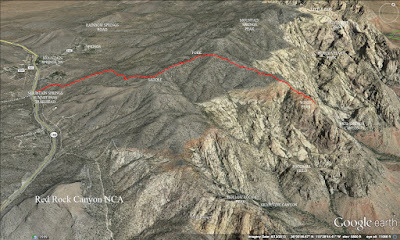 A short search recovered the wanderer who had gotten caught in an undiscovered valley. ... Okay, it has been discovered for a while now. 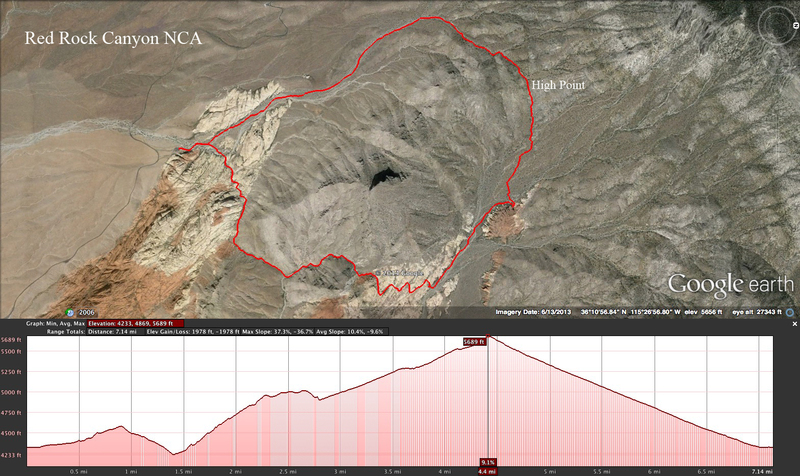 Anyway, we all descended down Heartbreak Hill with the exception of two who opted for the burnt ridge. A good hike. A good workout. Ugly weather.